Anna Burkett (L), the manager of the Solihull and Leamington branches of fabulous, with Jo Stroud (R), the owner of fabulous. Our 11th annual Fabulous Garden Summer Garden Party was a sell-out success! Thank you to the 66 guests who joined us at Mallory Court, the beautiful Relais & Chateau hotel outside Leamington that has been the venue for the event since it started in 2006. Although there was a spot of rain, even the poor weather could not put a dampener on things. Guests enjoyed a Pimm’s reception, a delicious 3-course lunch in the main-house restaurant, and the chance to browse and buy jewellery from over a dozen different collections. Jo Stroud, the owner of fabulous, gave an informative introductory talk about the brands present before guests were given the opportunity to meet designers and representatives from collections as diverse as ChloBo, Daisy London, Dower and Hall, to Beach Art Glass, Alex and Ani and Nikki Lissoni. Mantra Jewellery, our very first in-house brand, proved very popular with customers, and many had their Mantra pieces engraved and personalised on the day. Thank you to everyone who came for making the event such a success- we look forward to seeing you again next year! Click through for more photos of the event! Fabulous Futures Award: The 2015 Winners! We’re delighted to announce this year’s winners of our ‘Fabulous Futures’ Award, in conjunction with the Birmingham School of Jewellery, Sarah McCracken and Janet Royle. Fabulous have been working closely with final year students on the ‘Jewellery and Silversmithing – Design for Industry’ degree course, to give students a retail perspective before they go on to become designers or pursue a career in the industry. “Birmingham School of Jewellery has an excellent reputation for producing highly employable graduates with the skills needed within the jewellery industry today. We have chosen this particular course as it offers students a sound knowledge of the market, developing their technical skills within a commercial environment,” explains fabulous owner, Jo Stroud. 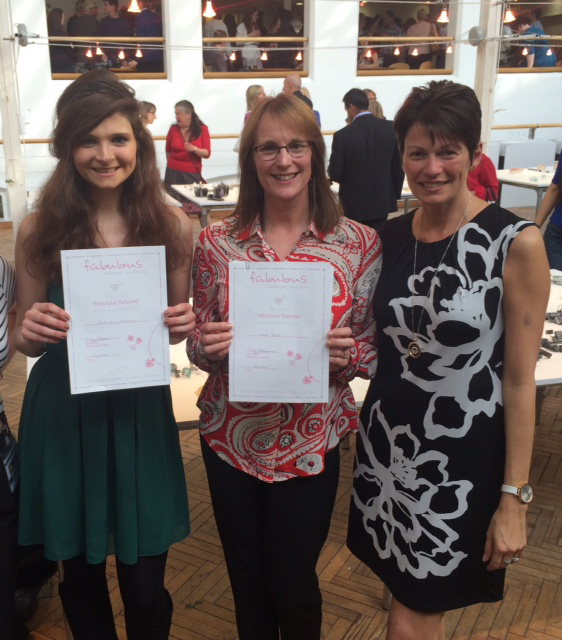 Jo Stroud, together with Sinade Prosser, Retail & Buying Manager at fabulous – herself a graduate of this course selected two students to be the recipients of the annual ‘Fabulous Futures’ Awards. The winners will receive mentoring sessions designed to help them consider their target market, the pricing of their pieces, the way jewellery is presented in-store and packaged for the consumer, and the ways they can showcase themselves online. They will receive a week’s work experience at fabulous, as well as winning the chance to appear at the fabulous annual Garden Party, where they will meet top customers and other designers. A £200 bursary for each winner will cover any expenses incurred during placements. Sinade Prosser graduated from this course in 2009, and has worked her way up at Fabulous since joining in 2007 as a part-time retail assistant while studying, to being part of the senior management team with responsibility for buying and marketing. “We chose Sarah because she had a real enthusiasm for fashion accessories. For her final project she had demonstrated good use of trend research and had incorporated many different textures and materials into her jewellery, in addition to precious metals. Sarah has a placement coming up at Vivienne Westwood and wants to develop a career as a designer within the fashion jewellery industry. We feel a placement at fabulous and some support from us will help her get started in her career! Congratulations to Sarah and Janet, we’ll see you at the Garden party and look forward to seeing you for work experience in the next few months! Our Top 5 Friends Thanksgiving Moments! When we were growing up Friends introduced us to Thanksgiving, the parade, American football and Monica’s infamous Turkey sandwiches. So we’ve put together our favourite Thanksgiving episodes, enjoy! Yep, it’s the one with Brad Pitt! When he and Rachel were an item this had to be the most hyped episode in the history of friends. Cue fat suits and prosthetic noses, we love the flashbacks in this episode and of course the romantic ending! Another classic from the early days of friends, the perfect reminder of what is important over the holidays, friends and family! So many funny moments, we particularly enjoy Rachel’s beef trifle and Monica’s Mum putting everyone in their place. The last ever Thanksgiving episode of the series, with a very emotional ending! Which Fashion Week City do you Belong in? This week we’ve been hosting our bi-annual Girls’ Night Out events in Bath, Solihull and Leamington Spa. Twice a year we showcase the latest trends in fashion and jewellery with a fashion show, guests sip bubbly, enjoy canapés and have the opportunity to see the new collections before anyone else, there’s also a raffle with amazing prizes and special offers on the night. 1. Where is your favourite place to shop? d) I’ll spend all day looking for something absolutely perfect, so I’ll scour the entire city! 2. What is your dream date? b) I’d love to be dressed up in my finest, at ‘the-place-to-be-seen’ – somewhere the A-list crowd go! 3. What will you live in this Autumn? 5. What jewellery will you be investing in this season? 6. What would your ideal wedding be? 7. Which watch would you buy?